We also offer range of portable display solution for multiples use – Magnetic Pop-up / Backdrop, Velcro Pop-up / Backdrop, Tower Pop-up, Pop-up Display Counters, Adjustable Backdrop Stand, Pop-up / Backdrop Displays are customized as per client requirement. These are available in various size frames and shapes including straight, curved and L-shaped. Whether you choose one of our existing shapes or create your own using our help, we’re confident you’ll find them a perfect match for all of your exhibition, event and conference requirements. These stands are comes in magnetic and Velcro attachment to the prints. Both the type stands have their own unique factors in usage, pricing and visibility. Pop-up / Backdrop Display Stands are widely available in customized sizes and are tailored in specific frames sizes to meet the closest possible size requirement. Our Custom Pop-up / Backdrop Display Stands are conceptualized understanding client requirement to the core and executed to meet perfect parameters to fit in the closest sizes possible. These stands come in anodized aluminium frames with lights and prints packed in a carry case to form a perfect kit for re-usability. These stands are the most effective systems in Portable Display Systems. These are widely used for their compactness and high graphic visibility. The graphic quality and structure shape creates pleasing impact on the viewers and attract target audience to the facility. Pop-up / Backdrop Display Systems are widely used all across Pakistan for exhibitions and one time investment for multiple exhibition setup. These stands create great avenues for exhibitors participating in multiple exhibition setups and are preferred systems for all exhibition, event, activities , corporate, property sites needs across Pakistan. 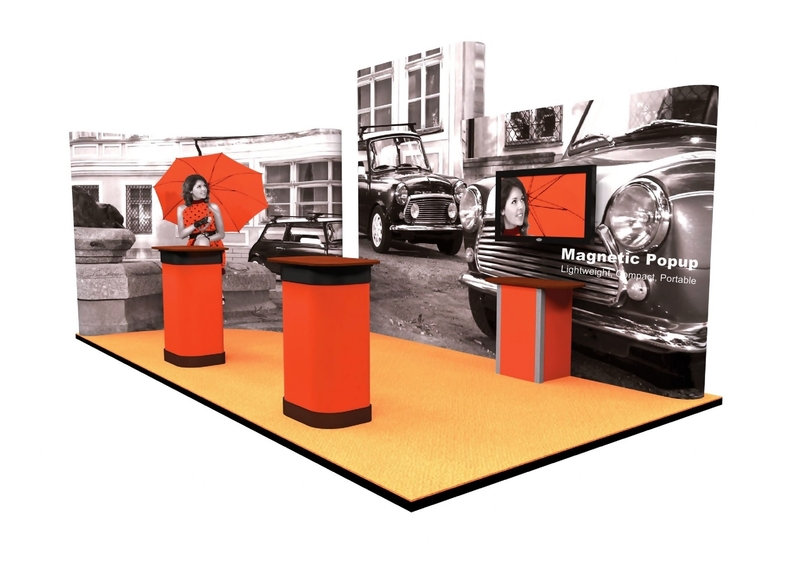 Magnetic pop-up also called as Magnetic Pop-up, Magnetic Pop-up System, Magnetic Pop-up Stand, Magnetic Backdrop, Magnetic display systems etc adds high impact and pizzazz to any presentation or exhibition stand. Pop-up displays provide maximum portability. A standard 3m backwall with lights and case to counter conversion will pack into one wheeled case. 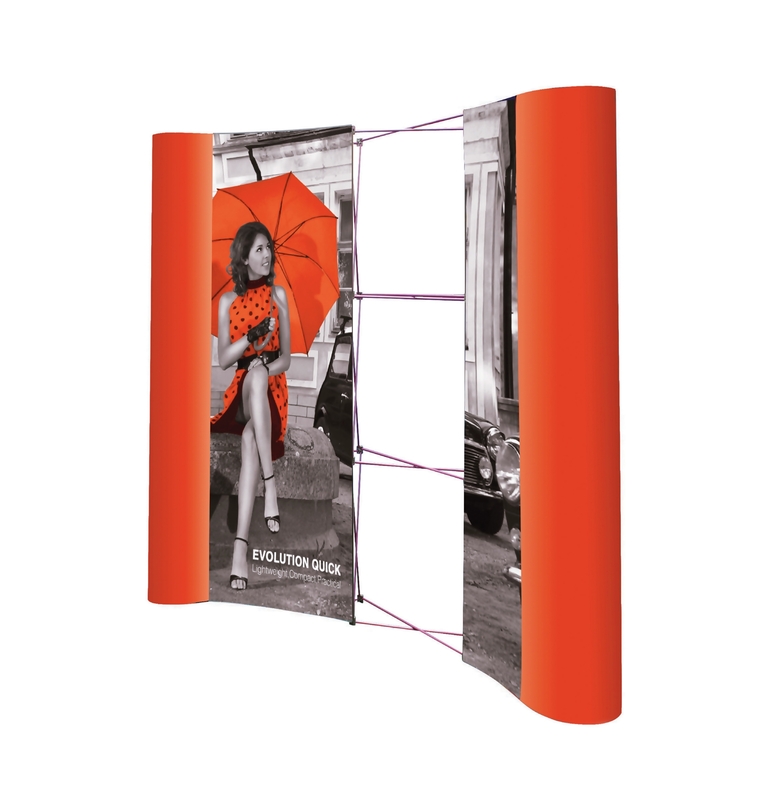 In addition to straight and curved pop-up displays it is possible to create a range of configurations for presentations and exhibitions. Available in Straight or Curved configurations. Curved display deploy as a mild curve and give added impact. Available in various size configurations and shapes based on client requirement. These stands are unique portable units and easily compacted in a trolley bag, air bag etc. 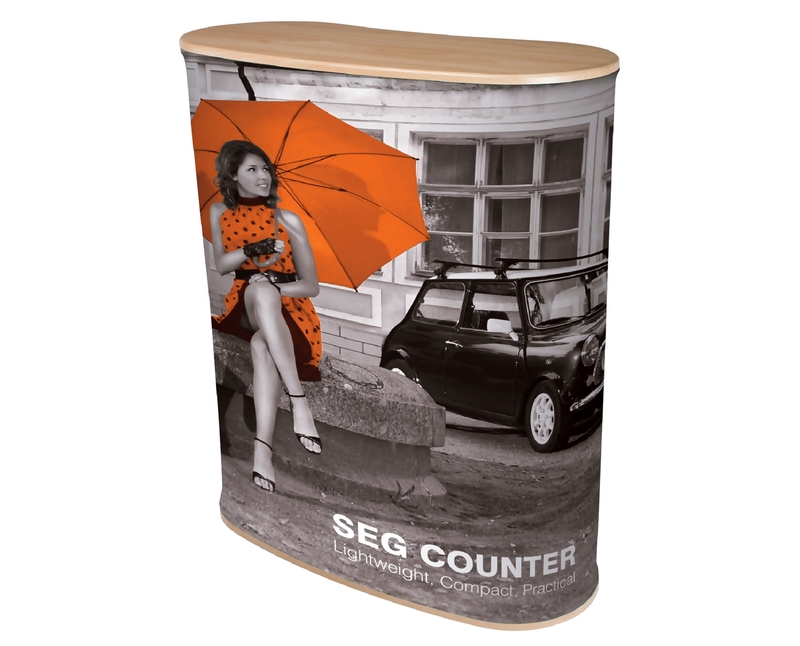 These are reusable units with changes in prints for multiple usage across varied range of campaigns for the clients. A single time investment with extensive usage for the display requirement. These are available in curved and straight system and easily configured in various sizes. Magnetic Pop-up / Backdrop comes in standard packing of Air trolley soft case. Clients can opt for Hard-case trolley to act as podiums or reception with prints in addition. Magnetic pop-ups / Backdrop have options available for shelves for product display and We customise Magnetic Pop-up / Backdrop based on client requirements. Easy to connect these units for form a larger display setup for exhibitions. These are widely used for exhibitions, events, malls, property Sites, corporates etc and offers great impact in capturing target audience attention. These are widely used in the market due to portability of the system and easy setup in minutes. Magnetic Pop-up / Backdrop offers a unique view to the stand due to its sophisticate look. 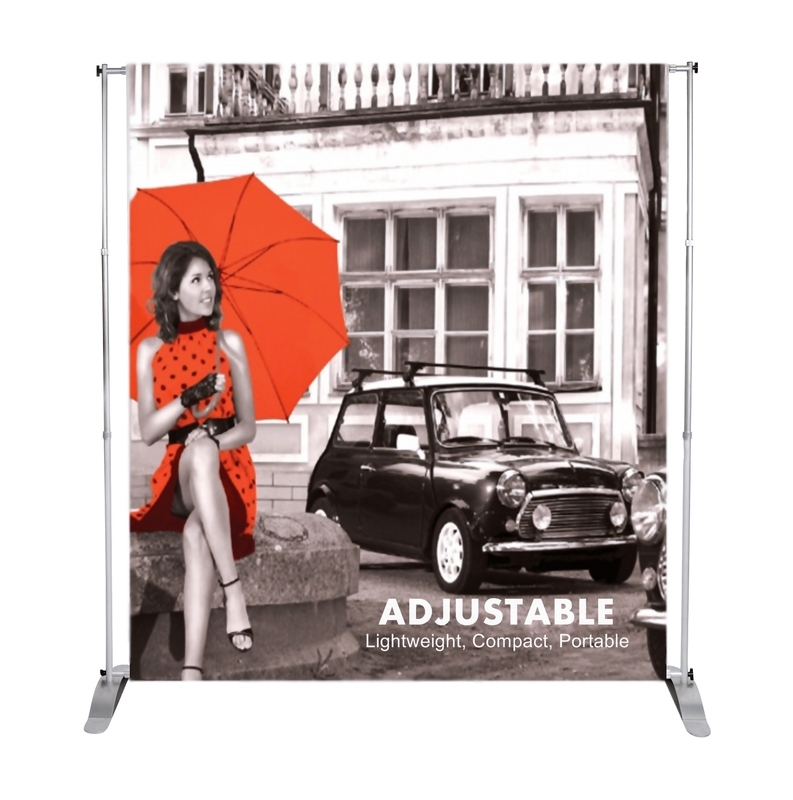 These are a great Backdrops that are collapsible, fold-able, reusable for any exhibitions, events, presentation, promotions, site office branding, commercials, malls etc. These are high quality structures customized to fit various sizes and configurations in various shapes and structures. We offer highly customized Magnetic Pop-up / Backdrop that can be made to fit various sizes and shapes as per client requirement. Structure can be modified to Straight or Curve as per client requirement. These Structures are great tools for any kind of Backdrop requirement and easily setup in minutes. Velcro Pop-up / Backdrop is very versatile stand available and portable unit packed in a hand bag for easy transit. These stands come with flex printing and easily replaceable print at affordable prices. A very versatile easy to use, cost effective pop-up system. To erect partitions, backdrops or just display large hoarding like banners. Print is stuck to the stand using male Velcro tape. Can be fixed or removed any number of times. Easily change graphics by fixing Velcro on new graphic. Can be carried in a shoulder Bag or An airline trolley case. These stands Made with Aluminium pipes chrome plated metal locking hooks, high quality plastic hubs brass nuts and high quality. Velcro tapes backed with basket material to provide support and long life to the product. These stands are Cheaper and flexible solution for portable display. Easy to setup, dismantled and carried to varied locations for brand solution. Highly effective printing and display system for varied usage. These stands are widely used in the market due to easy installation, dismantling and cost effective solution in portable solutions. Tower Pop-up System is an attractive, dimensionally, generous round portable pop-up display tower which attracts a lot of attention to your exhibition stand. Tower Pop-up creates a great advantage for centre space visibility due to its stylish look. These are great display options in circular displays used for centre piece. We supply high quality Tower Pop-ups in the market. 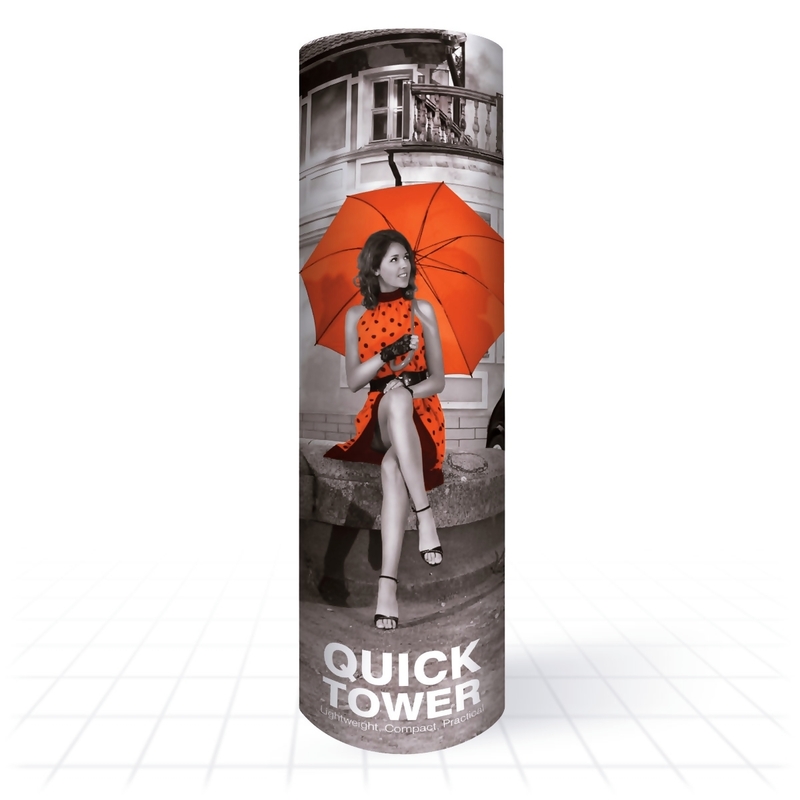 Useful for displaying a variety of graphics on space for stands, these Tower Pop-ups are not only strong but are durable as well attracting the passerby in a jiffy drawing his attention towards the product or advertisement. Bright and easy to install these, Tower Pop-ups are highly popular in the marketing arena and are available in various sizes and colors. Pop-up Display Counters are great tool for any kind of Portable Podium, reception, display requirements in exhibitions, events, malls, corporates etc. Table based on Pop-up design easy to use and carry anywhere for activities. Collapsible units packed in a carry bag easy to carry to various location for various activities. Adjustable Backdrop as the name suggest is backdrop with adjustable height & width as per size requirement. Adjustable backdrop are widely used for events, conferences, seminars, promotions etc. These Backdrops are a great tool for any brand visualization for any kind of activities. These Stands offer attractive, high-impact solutions for a trade show booth, false wall, visual barrier or backdrop. Lightweight, adjustable in both height & width and cost-effective, these stands provide excellent value for your display needs. These stands are widely used for conferences, seminars, exhibitions, events, display where the setup time is minimized. In just 10 minutes you are ready to go.